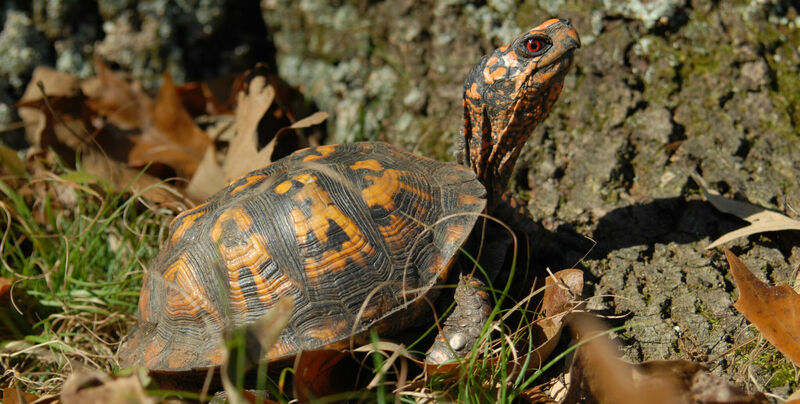 An Eastern box turtle (Terrapene carolina carolina) stands next to a tree on the floor of a Maryland forest. Researchers have identified a new biodiversity hotspot, one of only 36 in the world. The North American Coastal Plain biodiversity hotspot, which stretches from northern Mexico to southern Maine, runs along the coast and includes areas within major U.S. cities, most notably New York City and Washington, D.C. The hotspot is home to 1,816 species of plants, 51 species of birds and 114 species of mammals that are found nowhere else in the world. Among the notable endemic species are the Florida yew (Taxus floridana), an evergreen shrub/small tree; the Florida bonneted bat (Eumops floridanus); and a fish species known as broadspotted molly (Poecilia latipunctata). These three species are listed as Critically Endangered by the International Union for the Conservation of Nature. The threats to the hotspot’s biodiversity have been overlooked for a long time because until recently, people didn’t realize how much biodiversity the area truly held.